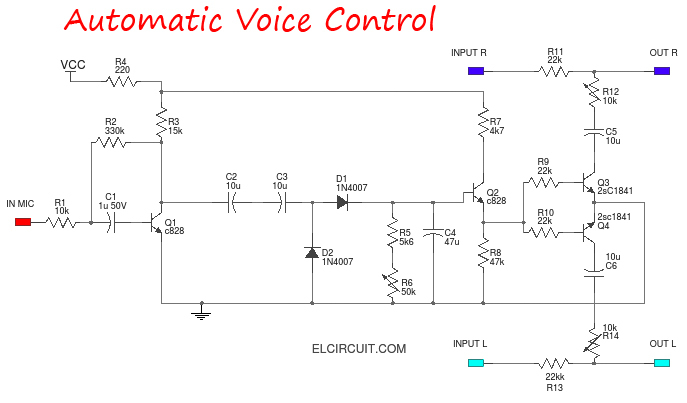 How To Make AVC Audio Voice Control - This simple circuit, I use the FM Transmitter at this time, the function of this circuit to eliminate noise backsound if no input voice of the radio announcer, the music will shrink what if there is no input signal from the pre amp mic , This circuit can be modified by replacing the last two transistors using IC 4066, PCB This scheme also Many electronics stores such schemes use multiple transistors or ic, works the same principle, namely to remove the vocals broadcaster. There many circuit that you can make, such as automatic sample voice control on the schematic below is my raft, and the results have been pretty good, basically perangat AVC is only for acsesoris course, I use this kit when no peer briker in frequency. on the circuit under the AVC is already in experiments and I wear, the results are pretty good, if they use exactly rich broadcasters, there are three components you can trim to adjust the audio, so that when the announcer spoke epek of audio does not quickly or slowly. For those of you who want to make the Automatic voice control, please, under the scheme has been my practice and the results are quite good. With a record in the process must be carefully filled, for the component I recommend its components must be new home. Why should it be new? reason to anticipate a failure occurs in assembling, because the kit AVC rely on the accuracy of a shock stored on elco.